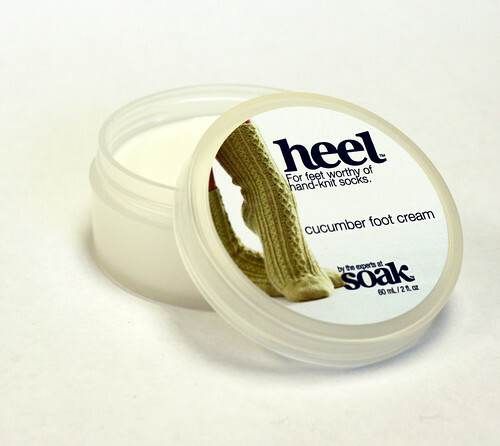 New from Soak | Heel- foot cream for feet worthy of hand-knit socks. Our unique combination of ingredients restores the skin and soothes tired feet. Cucumber extract, Vitamin E and the soothing powers of menthol work together to form a luxuriously rich treat for sock worthy feet. Go ahead. Indulge. Not a knitter? Heel– is perfect for all feet. Whether you are walking the mall in search of holiday gifts or treating your feet after a run, Heel is for you. We’ve launched this great product with a few of our favorite knitting friends. If you are part of the Loopy Ewe sock club, you were treated to the first batch of peppermint infused foot cream. 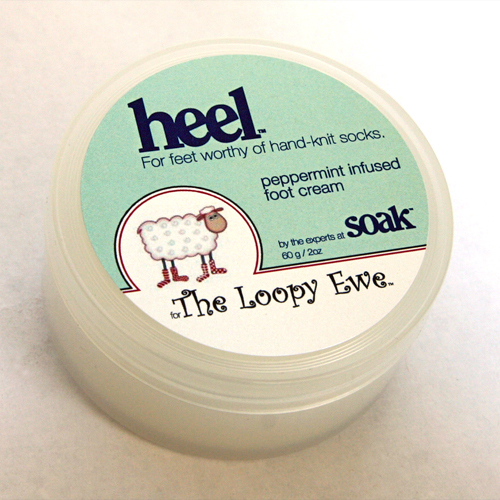 We were proud to launch Heel with the Loopy Ewe. Jimmybeanswool.com devotee? Get a customized tub of soothing scentless with menthol to match the Lorna’s Lace limited edition yarn Goblin. We’ll feature a new limited edition tub each month. There’s also a lovely basic Jimmybeanswool.com batch as well. Soak is also new to JBW. Check out the two-packs on their site. Along with our scentless Heel, you can also choose from our delicate and cooling cucumer or rich and soothing spearmint. These delectable treats can also be customized! With a minimum order of 24 units, we can customize the label to your heart’s content. Got a sock club, we can make a label for you. Are you a yarn retailer looking for special holiday gifts for your top customers, Heel is perfect. Knitting retreat? Yoga store? Shoe shop? Even if you have a great group of lucky friends (showers, bridal parties or charity runs) we can personalize Heel for you. Email us for a quote and conversation on custom designs. Another brilliant creation by the experts at Soak Wash Inc. Like Soak, you’ll wonder how you ever lived without it.